The high, grassy plateau between the Green and Colorado rivers has a long history of ranching and cattle grazing, and one melancholy episode is remembered by the name given to a narrow promontory that overlooks a large area of eroded red rock cliffs and canyons on the east side. The story goes that local stockmen rounded up a group of wild horses and corralled them by building a fence across the narrowest part, leaving the herd trapped at the far side. 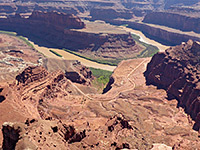 The animals were left too long without water and all died of thirst, so the area became known as Dead Horse Point, and because of its far reaching views over the Colorado valley was declared a state park in 1959, several years before the creation of Canyonlands National Park which contains a much larger area of similar scenery to the south. 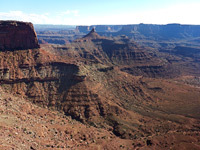 Today, the majority visitors see only Canyonlands which has many more trails and viewpoints, but the state park (2018 price $15) is still spectacular and has overlooks of tributary canyons in the northeast that are not visible from the national park. Dead Horse Point is a small state park covering just a few square miles of land at the edge of the plateau just north of the Island in the Sky region, and is reached by a 4 mile side road off the main approach to Canyonlands, just before the national park boundary. This passes a few side tracks to oil installations and other rim access points, then bends to the south and enters the park, where facilities are limited to a visitor center, a picnic area and a well-equipped 21 site campground, plus several trails; short paths to overlooks, and some longer routes intended for cyclists. There are none down from the rim but a few miles do run quite close to the unfenced cliff edge, and through meadows on the plateau. 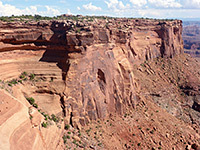 To the south, the entrance road passes over a narrow belt of land ('The Neck') which has sheer drop-offs just a few yards away to the left and right, and ends at a parking lot close to the far end of the promontory, where 500 foot high vertical walls of Wingate sandstone fall away at all sides. 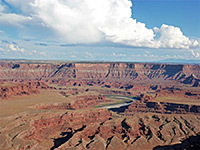 The main overlook of Dead Horse Point State Park has a 270 degree vista over the Colorado and its side canyons, from the bright turquoise-blue evaporation ponds of the mining complex at Potash to the northeast, along the river and south across vast areas of eroded ridges, buttes, pinnacles and cliffs with the La Sal and Abajo mountains in the far distance, then west to the near side of the Island in the Sky mesa and northwest along the three branches of Shafer Canyon. Plenty of the river and its corridor of greenery is visible, 1,900 feet below, including one big gooseneck meander close to the viewpoint. A dirt track winds over the rocky desert at the base of the cliffs - this is Potash Road, which follows the Colorado River starting just north of Moab. It is paved at first, as far as the potash mining complex, then unpaved for the next 17 miles, ending with a steep ascent up the cliffs at the head of Shafer Canyon where it joins the national park drive.